For other persons named Brett Butler, see Brett Butler (disambiguation). Brett Morgan Butler (born June 15, 1957) is a former center fielder in Major League Baseball and current base running/outfield coach for the Miami Marlins. He played for five different teams from 1981 through 1997. Butler's best season came in 1991, when he made the National League All-Star team. He was diagnosed with cancer in May 1996, received treatment and returned to the playing field four months later. He retired in 1997 and began a baseball coaching career. He has coached or managed numerous professional teams. He was the manager of the Reno Aces minor league team from late 2008 through 2013. Butler spent his teenaged years in Libertyville, Illinois, where he was a starting outfielder on the Libertyville High School baseball team that finished in the top 16 teams in the State his senior year. Upon graduating, he announced plans to play baseball in college, and his high school coach, Ernie Ritta, scoffed. Butler, who had explored walking on at baseball powerhouse Arizona State, made the team at Southeastern Oklahoma State University. The outfielder led the Savages to championships during all three years at Southeastern including an NAIA national runner-up finish in 1977. He was twice named to the NAIA All-America Baseball Team. Butler rewrote the record book at Southeastern. He was the Savage's first .400 hitter with a .439 average in 1977. He set career records in home runs (31), runs (209), triples (15), hits (220), walks (162), and career batting average (.394). After attending Southeastern Oklahoma, Butler was drafted in the 23rd round of the 1979 amateur draft by the Atlanta Braves. The Braves were building a contender with players like Dale Murphy, Bob Horner, and Glenn Hubbard after years of losing, but they lacked a leadoff hitter with speed. After playing in the minor leagues, he made his major league debut with the Braves on August 20, 1981. Butler helped lead the Braves to a 13–0 start and the National League West Division title in 1982, their first division title since 1969. He had another fine year with the Braves in 1983, but they finished second in the West to the Los Angeles Dodgers. In October 1983, Butler was sent to the Cleveland Indians (along with Brook Jacoby and Rick Behenna) to complete a deal in which the Braves had acquired Len Barker for cash, toward the end of the 1983 season. In 1984, he became the first batter Roger Clemens would face in the big leagues. He played with the Indians for four seasons, batting a career-high .311 in 1985. Butler signed with the San Francisco Giants as a free agent after the 1987 season and established himself as one of the premier leadoff hitters in the National League. He helped the Giants to the NL pennant in 1989, as the leadoff hitter in a lineup that included Will Clark, Kevin Mitchell, and Matt Williams. Following the 1990 season, Butler signed a contract with Los Angeles Dodgers. As a member of the Dodgers from 1991 to 1995, Butler reached the prime of his career. In 1991, Butler earned a roster spot on the National League All-Star team, and finished 7th in MVP voting. During the 1995 season, Butler was signed as a free agent by the New York Mets. In August 1995, Butler rejoined the Dodgers in a trade for Dwight Manees and Scott Hunter. After finishing the season with the Dodgers, he again became a free agent and returned to the Dodgers. In May 1996, Butler learned that he was suffering from squamous cell carcinoma of the tonsils, a type of cancer which only rarely involves the tonsils. Following an operation to remove the tumor, and intensive treatment to combat the disease, he returned to the Dodgers' lineup in September of the same year—defying the predictions of those who had speculated he would never be able to play again. 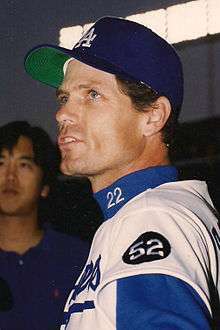 Butler finished the 1996 season with the Dodgers and played with them for one more year, participating in his final game on September 28, 1997. Throughout his career, Butler produced a .290 batting average, 2,375 hits, and 558 stolen bases. Many consider him to be one of the best leadoff hitters of the 1980s and early 1990s, due to his high on-base percentage, speed and dynamic bunting. Butler began his coaching career in the spring of 1998 as the assistant coach of the Duluth Youth Baseball and Softball Association's Minor League Dodgers team, the team on which his son was playing. He was able to secure and provide replica game and practice uniforms for the boys and coaches. Butler helped coach the Dodgers to a second-place finish in the Minor League championship game that season. Butler was a coach with the Arizona Diamondbacks for the 2005 season. He was hired to manage the Lancaster JetHawks of the Class-A advanced club for the 2006 season. He was hired to manage the Mobile BayBears, a newly acquired Double-AA team Arizona Diamondbacks, for the 2007 season. 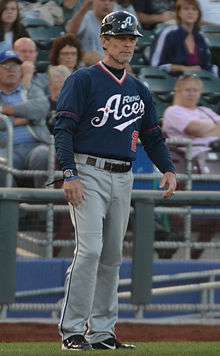 In October 2008, it was announced that Butler was hired to manage the Reno Aces of the Class-AAA club for the Arizona Diamondbacks. In 2012, Butler led the Reno Aces to their first ever Pacific Coast League Championship and also led them to the Triple-AAA National Championship in the same year, where they defeated the Pawtucket Red Sox 10-3. Butler was named as a coach for the 2011 All-Star Futures Game. On October 11, 2013, Butler was named the third base/outfield coach for the Miami Marlins. Butler, a born-again Christian, has been active in a number of Christian and pro-life causes. He lives in Phoenix, Arizona with his wife Eveline and their four children, Blake, Abbi, Katie, and Stefanie. On April 24, 2006, Butler was hospitalized with chest pains after a Lancaster JetHawks game he managed. Butler apparently did not have a heart attack, and underwent further tests. Butler returned to his coaching duties "after a week off due to a viral infection." On July 29, 2007, Butler was hospitalized again after suffering a mild stroke. Brett Butler (1997). Field of Hope: An Inspiring Autobiography of a Lifetime of Overcoming Odds. Thomas Nelson Inc. ISBN 0-7852-7144-9. ↑ "Sports Figures". Oral Cancer Foundation. Retrieved 2007-09-18. ↑ Hudson, MaryAnn (19 June 1994). "Every Day Is Father's Day : Family Is Close to Dodgers' Brett Butler, Even When It's Across Country". Los Angeles Times. Retrieved 7 June 2015. ↑ "May 1, 2006 game recap".